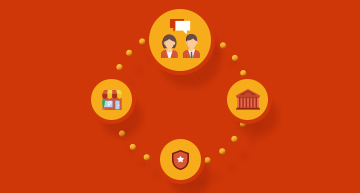 Too many enterprisers take a reactive approach to managing regulatory affairs. To engaged with their own internal digital transformation program, they are left in the dark when policymakers set new directions in the form of a new national digital strategy and policy. They forget that regulators are critical stakeholders whose decisions typically have a limiting effect on incumbent companies. In heavily regulated industries such as banking, telecommunications, healthcare, utilities, and manufacturing, failure to comply can lead to fines and foreclosures that damage both revenue streams and reputations. At the highest level, the solution is fairly straightforward. Enterprises must set up a Regulatory Affairs Management function that engages regulators when developing and executing corporate strategy. A lack of a systematic approach for assessing the impact of pending and new regulations on the business. No clear policy position. Enterprises need to have strong, realistic, and reasonable policy positions worked out before engaging with regulators. Lack of coordination with internal stakeholders. Aligning strategic goals with regulatory frameworks requires clear communications between board members, C-level managers, and business units. By elevating Regulatory Affairs Management to the top of the priorities list, companies can better prepare for regulatory change. Moreover, they can often influence change. The systematic assessments they make for themselves and their own industries can also be used as a foundation for creating models that analyze the impact of a Regulatory Affairs Management framework or proposed change on social, economic, and cultural structures. These models can then be presented to regulators, and often reveal that forward-looking enterprises are better informed than regulators and can educate them on key issues. The Synergy Consulting Group helps companies strengthen the management of the Regulatory Affairs department and capabilities in a systematic and actionable way. It starts with a coherent and actionable strategy that ensures the right priorities are set and that the right capabilities and processes are put into place to delver on those priorities. First and foremost, the corporate strategy and objectives must be clearly delineated and their implications for a potential regulatory strategy clearly spelled out. Enterprises must then undertake a detailed assessment of the regulatory environment and their own capabilities for engaging regulators. For developing regulations, governments often look to neighboring nations and “model” nations for guidance. SCG can assess relevant global regulatory frameworks and how they may inform local policies and regulations. We also help enterprises fearlessly assess their internal capabilities and the degree to which they can map regulator plans, track stakeholder behavior, and propose alternative regulations. 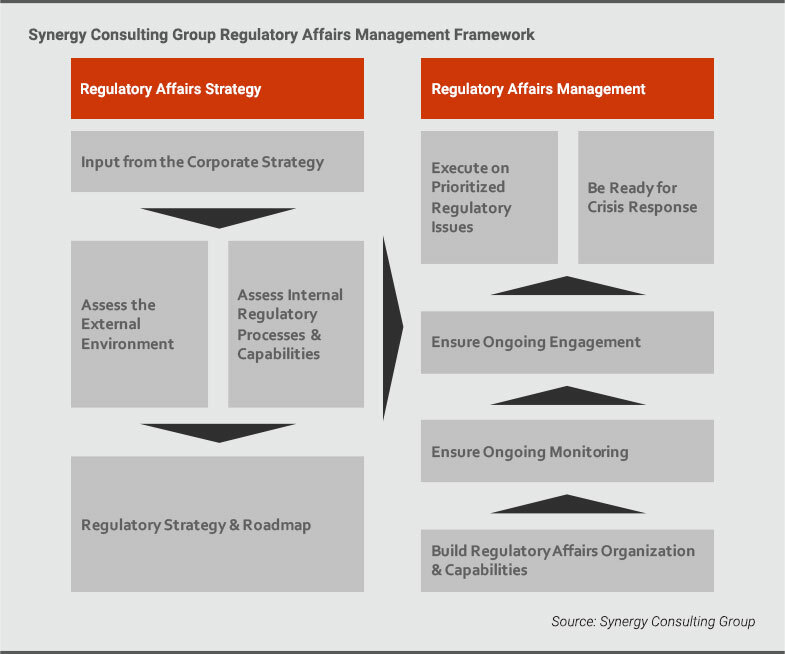 Synergy Consulting Group uses these assessments to define a holistic regulatory strategy for the management of your Regulatory Affairs department, aligned with your corporate strategy and it goals. As part of this, we provide value-at-stake assessments and define capability gaps needed to achieve desired results. Create fact-based narratives to support key positions. Develop a stakeholder map for each issue – and tailor messages to stakeholder objectives. Quantify the economic impact of a framework or proposed change on the company and on stakeholder groups. Proactively engage stakeholders on any given issues with a systematic plan for staying in touch. Be ready for a crisis. We help you define a clear process for responding, assign clear roles and responsibilities staff, and train staff using best practices. Finally, taking a proactive approach to Regulatory Affairs Management means taking the long view – as the benefits of executing on a regulatory affairs strategy can take years to bear fruit. Enterprises must therefore be systematic about maintaining momentum on execution of Regulatory Affairs strategies. They must set up processes to monitor their own activity. Regulatory Affairs should also monitor regional and global regulatory issues that may eventually have local impact. They must make the review of stakeholder engagement a central part of Board and C-level meetings. This is to ensure they remain top priorities and that coordinated action continues. And of course enterprises must continue to build their Regulatory Affairs Management organization and capabilities. Continuous review of the positioning, relationship monitoring and assessment, and training are critical.